Welcome to the Sault Ste. Marie Gymnastic Club (SSMGC) Summer Day Camp Program 2017. Sault Ste. Marie Gymnastic Club offers a summer of action packed, fun filled experiences for children between the ages of 4 and 12 with an emphasis on skills development, self‐esteem, social skills, and fun. Our campers will spend the summer making new friends, trying new activities and exploring new adventures. Camp activities spark both interest and imagination from gymnastics, sports, swimming, games and outdoor activities to creative arts and special events. Weekly themes add a special touch, keeping the smile in every camper’s summer. 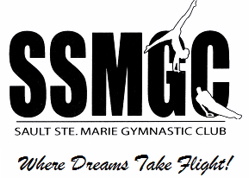 The SSMGC Summer Camp is based out of the Sault Ste. Marie Gymnastics Club located on the 2nd floor of the John Rhodes Community Centre. Parking for drop off and pick up is in the Visitor’s Lot out front of the building. Early Drop Off: 8:00 a.m.
We feel confident that we have the best staff in town! Our staff is as diverse as our campers. Staff members are at least 18 years old, with the exception of a few outstanding 16 & 17-year-old employees. All of our staff has at minimum level one certification in gymnastics. Each employee has had a criminal background check and several are CPR and First Aid Certified. We do everything to make sure your child will be safe in the event of an emergency. Most importantly, our staff are people who love kids. They want to spend their summer playing, teaching and working with children. Bullying will not be tolerated. We believe that every camper should have the opportunity to participate and receive instruction in a variety of physical activities delivered in a fun, social and safe environment free from harassment. We work together to ensure that campers gain self-confidence, make new friends and leave with great memories. Our goal is to promote healthy, active living. Therefore, staff will act to quickly address incidents of bullying and promote excellent communication between camper, staff and parents/guardians. Our campers are placed by age groups of not more than 10 campers to one staff member. This should be a summer of laughter, fun, and good times for your camper. Our expectations for behaviour are very specific, but very simple: respect of self, respect of others, respect of property. That having been said, we do not anticipate many disciplinary actions to be taken this summer. However, should the need arise; a wide-array of methods may be employed. We fully understand that the discipline that would be appropriate for a 10 year old may not be for a 4 year old. As such, age-appropriate discipline will be employed. We want for you to be completely aware of all aspects of your camper’s experience at SSMGC Camp. Fighting, discrimination of any sort, stealing or destruction of other’s property (i.e. other campers, SSMGC’s, or any off-site location visited by the SSMGC Day Camp) will result in a Level 5 or higher disciplinary action, depending on the severity thereof. A camper may be suspended for as little as a day, or as much as a week. If expelled, depending on the severity of the warranting actions, campers may face a seasonal expulsion (for the summer) or a permanent expulsion from the SSMGC Camp program. Sunblock – SPF 45 is advised. *Please do not bring any portable game devices, weapons, or valuables to camp! To accommodate parents and guardians’ work schedules, we provide an early drop off and late pick up service as part of your weekly cost. The early drop off/late pick up is supervised with minimal programming. Children will be asked to relax or participate in low activity games. Early drop off is available beginning at 8:00am each day and late pickup runs until 5:30pm. During this time, campers will be provided with a variety of games and activities. If your child is not picked up by 5:30 p.m. there will be a $5.00 charge per minute after 5:30. The late fee is payable to the camp staff at time of pick up. This will be adhered to and may affect camper enrolment. Campers must be dropped off and picked up at the gym only by the parent/guardian authorized (on the registration form). The parent/guardian must sign the camper in and out with the staff member on duty. When signing a camper in, please indicate who is picking up the camper (if different then yourself). Campers will only be allowed to leave with the person authorized to pick them up, as indicated on the registration form. If your child is going to be absent from camp, please contact the camp office at 705-254-2259. We have a “nut-free” policy for all food brought to camps. For the sake of children with allergies, please ensure all lunches and snacks you pack for your child complies. Lunch is scheduled at 12:00pm each day unless otherwise communicated. Lunches should be brought in small coolers, lunch boxes or bags. Please label your child’s lunch container clearly. Please do not send glass of any kind. On Fridays, pizza (cheese and pepperoni), cupcake (Thyne’s Bakery) and juice box will be given to your child for lunch. The cost of Friday lunches is included in your weekly or daily fees. Please provide your child with a (nut free) morning and afternoon snack each day. Camp staff members cannot administer or provide your child with any medication during camp. Please plan accordingly. Asthma Inhalers and Epi-Pens may be carried on the child or with the supervising staff. These items may be left at the front desk during indoor activities. If your child becomes ill while at camp, you will be notified. We may ask you to remove your child from the program for the day. To avoid risk of infecting others, please do not bring children to camp if they are ill.
Campers found with head lice or nits will be sent home from camp and must undergo a treatment and be free of nits before they will be allowed to return to camp. If your child is injured, our staff will take whatever steps necessary to administer/obtain medical care. If we are unable to reach you and your child needs medical attention, s/he will be transported to the hospital by an ambulance. All expenses for emergency medical care are the responsibility of the parent or guardian. The supervising staff member will complete an accident report and a copy will be provided to the parent/guardian. A weekly offsite trip or two is offered for each camp. The costs of these trips are included in camp registration fees. For trips that are not within walking distance, the campers and staff will be traveling by City Transit. In addition to the weekly offsite trip, some camp activities may occur at offsite locations that are within walking distance of SSMGC (ie. Bellevue Park). The consent for these offsite activities was included on the registration form. An exciting part of camp is going on the weekly field trips. This involves riding the city bus, which can be a new experience for many campers. To ensure campers’ safety, the SSMGC staff will review bus safety procedures each time the campers board the bus. Swimming will be offered every Tuesday and Thursday afternoon for children 7 and older. Due to the ratios, children under the age of 7 will be unable to participate in the swimming component. For campers between the ages of 7 and 10 the ratio for staff to camper is 1 to 4. Regulations state that if a child wishes to swim in the big pool they must pass the swim test and receive a bracelet from the lifeguards at the John Rhodes pool. If they do not pass the swim test, they must remain with their coaches in the two smaller pools. Coaches still accompany children in the big pool as well. In addition to SSMGC coaching staff, John Rhodes lifeguards are on duty as well at time of swimming. For children who are too young to swim, crafts and activities as well as outings within the perimeter of SSMGC are planned. As many of our camp activities are held outdoors, parents are asked to ensure they apply sunscreen before arriving at camp. Please also pack sunscreen in your child’s backpack so they may reapply throughout the day. Due to sunscreen allergies, SSMGC Summer Camp will not provide sunscreen. Please also have your child wear or bring a hat. In case of inclement weather (i.e. rain, heat, poor air quality) some outdoor activities will be adjusted to ensure the safety and wellbeing of all participants. For excessive heat/humidity we will endeavour to provide frequent rest periods and fluid breaks during activities. Camp Staff will be taking photos throughout the week for our summer camp wall and sometimes for crafts such as photo frames. No names will accompany pictures. For any reason you do not want your children’s picture taken for these purposes please advise the camp staff. Photo consent for purposes of promotional materials was included on the registration form. Photos of children (without names) will only be used if consent was given. Please label everything. Non-labelled items left behind each day of camp will be placed in our lost and found container. Campers and parents should go through the lost and found often. All unclaimed items remaining at the end of the summer will be dontated to charitable organizations. The Camp Staff are looking forward to an exciting summer, filled with great memories and lasting friendships!